Joong Boo (formerly Chicago Food Corp) gets a deserved mention here and there, but rarely does the cozy little in-house cafe get a nod. 'bout 18-seats tucked away in a corner of the store the cafe serves volcanically hot soups, stews, plate lunches along with kimbap, crunchy fried hot/sweet Korean chicken drumettes and a rotating assortment of take away items. On an excursion for fill in ingredients for another round of Spare Rib Fried Rice I deviated from my typical order and ventured into the wilds of Al-Tang, #11 Spicy Pollack Roe and Tofu Soup. In the words of Inspector Gadget, Wowsers! Not only was the soup lava flow hot, but the spice level was such my brow sweat and eyes teared. And, immodestly, I have a markedly higher spice tolerance than average. Even though I was at Joong Boo, a full service Korean grocery with a wide selection of kimchee, I still stopped at my favorite New Chicago Kimchee for both cubed radish kimchee and cabbage kimchee. Missing Chicago bigtime right about now. Joong Boo is a frequent stop on my commute from Albany Park back to Noble Square on the Kennedy. Their produce section has a pronounced vegetive aroma even in the dead of winter- the produce even has dirt on it! I also love their butcher counter for kurobuta pork belly and thiny sliced kalbi. When I lived in Logan Square years back this was often a one stop shop for cheap groceries and a good enough selection of Chinese and Japanese ingredients with a handful of southeast Asian stuff. At that time I was in the dark about Korean cuisine, despite access to restaurants in the vast Korean community on the northwest side. The lure of the cafe has always interrupted my usual shopping pattern right at the end of the produce section. Enticed by aromas and dirt cheap prices, I sampled my first bowls of Bibimbop and Yookgaejang. From there, armed with a large tub of gochujang, my interest in Korean cuisine peaked and while still unable to find the right Korean cookbook (suggestions? ), I studiously, through dining out research began my quest to reverse engineer many of these stimulating dishes. Three cheers to the Joong Boo Cafe for sparking this inquiry and after a long day at work, I still cannot resist a $6.00 bowl of spicy beef stew with an array of accoutrements before I even complete my shopping. I've been in Decatur since Saturday with a killer cold and last night all I really wanted to eat was a bowl of al-tang. And of course, being in Decatur without any Korean ingredients and with the vegetarian refrigerator of my fiance, I couldn't have any sort of Korean stew. And now I just saw your picture and well frankly, I died a little inside. Now I know where I'm going to eat dinner tomorrow night as soon as I get back up to Chicago. When did Chicago Food change its name? Jefe wrote: Their produce section has a pronounced vegetive aroma even in the dead of winter- the produce even has dirt on it! Only on LTH would someone make such a pronouncement so excitedly. Gotta love it. Finally back in town and got a piping hot vat of Al-Tang today for lunch. There were no tables open so I took a seat at the counter and sat next to a non-Korean gentleman who ordered the same thing. I congratulated him on his spice tolerance as he wiped his brow and blew his nose a few times as we slogged our way through the large stone bowl of red-hot goodness. The stew was full of tofu, jalapenos, mushrooms, cubes of korean radish, and of course the pollack roe. I feel like this lovely bowl of spicy happiness finally kicked my lingering cold to the curb. Yay! I can breathe again! When I was pregnant with my son, I would often stop in at Chicago Food Corp on the way home from work to eat dinner. For some reason, I just craved bimbimbap when I was expecting -- it's the ultimate comfort food, after all. It was so great, because I could be in and out of there in less than a half and hour. Sharona wrote: Finally back in town and got a piping hot vat of Al-Tang today for lunch. There were no tables open so I took a seat at the counter and sat next to a non-Korean gentleman who ordered the same thing. I finally visited the Joong Boo Cafe with family this summer and can testify that it can get crowded in there, especially during peak mealtimes. I felt bad that people stood waiting for their food while our party took up the long table by the servers. 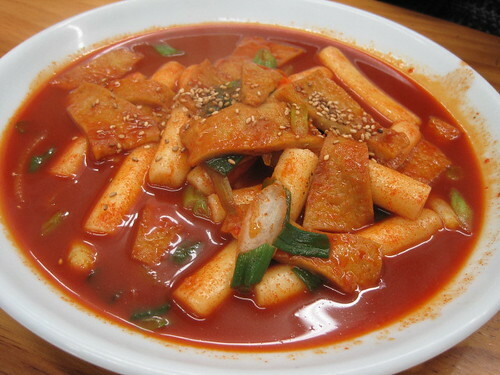 But, yeah... good soups at a good price, though I still prefer the hot cod stew (with tofu) over at San Soo Gap San. Tonight before shopping I had the Cod FIsh Stew, which contained a few pieces of an unidentified offal. 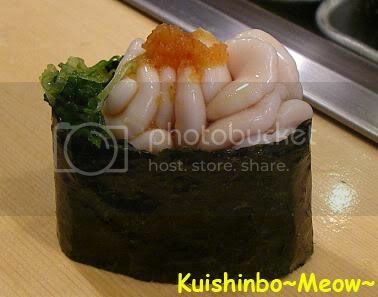 They looked brain-like, but I assume they were organs from the fish and fish brain seems like an uncommon offering. It wasn't ovary. I am stumped. My camera phone just did not capture a clear image of the chunks. Overall, the soup was underwhelming. The fish had been stewed to the point of spent, yet the bones and skin lent a fishy funk to the broth. The soup base was gochujang, which was used somewhat lightly for my tastes. An aromatic of some sort is needed to balance such an intensely fishy broth. Actually, the brainy bits were probably the most tasty part of the soup, delicate and creamy. Anyone have any idea what I just ate? Last edited by m'th'su on November 25th, 2008, 8:30 am, edited 1 time in total. m'th'su wrote: Did they look like this? That was not what I ate. Frustratingly, for someone who has gutted many a fish- and been known to pop raw pieces of ovary, roe, and liver in his mouth during the process- I just could not seem to place the guts I ate last night- about the size of a quarter and segmented like a brain. Well, thank google- I figured out that what I sampled was cod sperm sac. Check that one off the list! Jefe wrote: I figured out that what I sampled was cod sperm sac. Check that one off the list! We had that one night at the now departed Matsumoto. Yes, it made me stronger. Don't seem to have a picture of the cod sperm sack, but did come across this picture is worth a thousand words of Trixie-Pea eyeing squid guts at Matsumoto. That picture may be worth a thousand words, but probably not the thousand words that you might imagine from the look on my face. From what I remember, the guts tasted as good as they looked bad. I am not as enamored with the cod sperm sac. I miss Matsumoto. Trixie-pea, you should consider entering that photo in one of those "caption this" contests. I think it would get some great responses! A friend who I had not seen in a while called this afternoon and asked if I wanted to catch up with a shopping trip to Joong Boo. A short while later we were on our way. After filling our cart and in danger of buying more food we didn't really need, we decided we should eat something, so we are parked our goods and ordered ourselves a #9 and #21 at the snack counter, the Tukbokki and Soondae Gook, respectively. Granted, the former is a very simple dish, but I'm a sucker for garaetuk and, well, most anything cooked with kochujang. Such a beautiful hue and fiery. 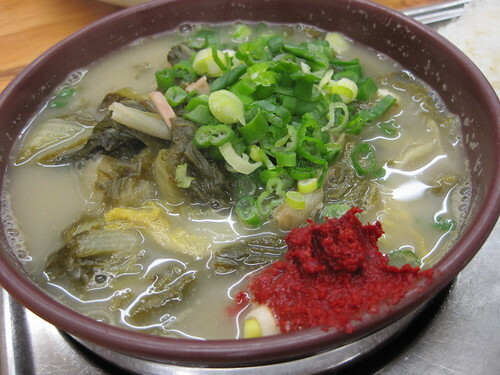 Though of course much milder, the soup had a lot going for it including rich greenery, an almost milky broth and suitably jiggly slices of just funky enough soondae. Our lunch came to $15 and hit the spot. My friend, who recently had a very underwhelming first visit to Schwa exclaimed, "This is better than Schwa!" Our Joong Boo expedition also included more than an hour of exploring the housewares section. There's too much fun to be had there, but my friend and I had one pressing question that perhaps a worldly LTHer could answer. In the "intimates" section, we found these boxer shorts that from the outside look like regular underwear. Attached, however, to the inside front is a burlap-like sack. We think we know what goes in there, but the picture on the box confused us, as the underwear seems to be worn inside out and with a string of beads attached to the burlap. Can anyone explain to me in PG-13 terms what this is about? We also picked up some dish towels and giant chop sticks. Joong Boo, clearly a one-stop shop! happy_stomach wrote: Can anyone explain to me in PG-13 terms what this is about? I'm guessing it's supposed to hold suitably jiggly slices of just funky enough soondae. I stopped by Joong Boo to pick up some tofu on my way home and was thrilled to see there are now dumplings being made right out front!! Of course I bought one of each of the three flavors (veggi and pork, kimchi, and red bean in a black rice bun) and then an extra kimchi one because... well I didn't realize I would be full after two. They just opened on the 7th, and while I waited for my order I could see fresh ones being stuffed and sealed. It's so convenient and cheap, I imagine I'll be grabbing them for lunch and car snacks quite often. evelyn wrote: I stopped by Joong Boo to pick up some tofu on my way home and was thrilled to see there are now dumplings being made right out front!! Of course I bought one of each of the three flavors (veggi and pork, kimchi, and red bean in a black rice bun) and then an extra kimchi one because... well I didn't realize I would be full after two. Wow, freshly made Korean dumplings sound good to me, though $2 each seems a little pricey ($24/dozen). Can these be frozen and thawed without turning to mush? If so, would you cook them without thawing? I cook frozen Chinese jyaudz by browning one side, then throwing a couple of tablespoons of water in the pan then covering it with a lid to steam the top. Would this method work with Kim Chee dumplings? Wang mandu are basically baozi, not jiaozi. I'd reheat in a steamer. A microwave would work fine, too. cilantro wrote: Wang mandu are basically baozi, not jiaozi. I'd reheat in a steamer. A microwave would work fine, too. Got it. Thanks. I have a steaming basket. I have never heated bao in a microwave. Do you need to place them in a covered dish so they steam, or can they be cooked uncovered? Doesn't the dough become chewy? d4v3 wrote: $2 each seems a little pricey ($24/dozen). They might be cheaper at the dumpling stand in the food court of H-Mart. I don't know their pricing for sure, but as you say, $24/doz. does seem pretty steep. The H-mart stand has a wider variety, too. Yes, they're the big bun kind of dumpling. They come hot and ready to eat, but I would steam it to reheat leftovers. Like I said, 2 filled me up so I suppose I consider $4 to be a great price for lunch, plus convenient since it's right by my house, so I'm biased. I'm hoping for different fillings on different days. I had no idea this place had a café inside! Another place to walk to! Whenever Mr. Pie was sick, he would get Dr. K's Cure All Soup from Amitabul. Is there an equivalent here that someone can recommend? d4v3 wrote: I have never heated bao in a microwave. Do you need to place them in a covered dish so they steam, or can they be cooked uncovered? Yep, microwave them covered or wrapped in plastic. Sprinkling a bit of water also helps. evelyn wrote: Yes, they're the big bun kind of dumpling. They come hot and ready to eat, but I would steam it to reheat leftovers. If they are the cue ball sized Bao, then $2/ea is not too bad. There is no size reference in the pix. I thought they were smaller like Jyaudz (excuse the Yale Romanization, that is what they teach in the military). Filipino places generally charge about $2.50 for a Siopao. Sorry, I'm better at eating then photographing. I just reheated this one though with a damp paper towel in the microwave, and it's still good the second time around. evelyn wrote: Sorry, I'm better at eating then photographing. I just reheated this one though with a damp paper towel in the microwave, and it's still good the second time around. Wow, thanks for taking the time to shoot and post the photo. I can now see that the dumplings are, indeed, much more substantial than I thought. Now, $2 actually seems like a fair price, especially since that includes tax. The black rice and red bean mandu look interesting. How did they taste? BTW, I wasn't criticizing your photographic skills. In fact, the photos were quite good. I just needed a point of reference to judge the size.